In previous posts I affirmed that pigeons are peaceful and innocent creatures whose major fault is not being aware where to poo or to nest. Now, after watching this episode of Pigeons from Hell, I realised that I was wrong because pigeons are not as innocent as they are supposed to be. In this episode pigeons are souls that leave Hell during night and roam around a deserted plantation mansion. This is quite perturbing, but when we discover that they just not leaving Hell for a short excursion, but they actually enjoy causing suffering to humans, we realise that we are facing a dreadful horror situation. The sign on the left warns us about the undesirable side effects of feeding pigeons. 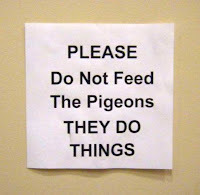 The author probably tried to be polite by avoiding mentioning nasty pigeon actions. However, if we re-read it in the context of this episode, we realise that these things include actions like murdering or zombification (by means of voodoo). Dreadful. The following pictures correspond to an artist's conception about the contrast between angelic and evil pigeons. Artist's conception of the contrast between pigeon angels and an evil pigeon from hell. I think that it is a creepy presentation that doesn't prophesy good human-pigeon relationships. Pigeons appear at the very beginning of the episode. John Branner and his friend Tim Griswell are traveling by car and it breaks down close to a deserted plantation mansion. John decides to explore the area and when he approaches to the building he finds a flock of pigeons that mysteriously attack him. John approaching the old plantation house. We can see the flock of pigeons in front. John is scared by the pigeons. John: There were pigeons all of a sudden…they came right at me, right at my face! Tim: Pigeons! You sounded as if somebody were trying to kill you! John: That’s just it! … It was like they were attacking me! Due to low budget and old recording technology, this film doesn't have good special effects and the pigeons don't look very scary. However, there is some very good sound engineering work that makes the pigeon's cooing sound dreadful. The best example is when John wakes up, apparently under hypnosis and he goes upstairs to face his death. At this time, the pigeon sound is really horrific. John seems to be a nice boy, but after the pigeon's influence he transforms into a murderer zombie. This sequence can be seen here. I spent many years close to pigeons. More specifically, they were on the roof above me. I know what it's like to wake up by loud pigeon noises (probably mating songs). But the noise in this episode is different, it's a dreadful definitive sound... coming from the hell. 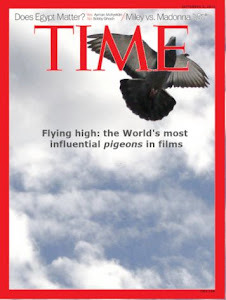 In this film there is another important pigeon performance. When Tim returns to the mansion with the Sheriff, they found his car completely populated by these evil creatures. In the pictures below, you can appreciate the sheriff's face full of suspicion. Pigeon activity: They are evil and they try to cause pain and suffering to humans. Symbolism: The symbolism is very important. They represent evil souls that roam around. Relevance: High. Pigeons are one of the key elements of the plot. Training level: Low. 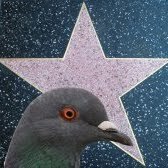 It is difficult to feature pigeons as evil-deadly creatures and it was even more complex in the 60s, without computer-aided special effects and a low budget. 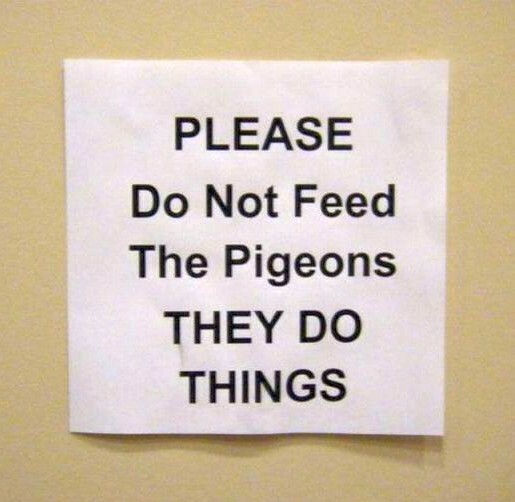 This is why the pigeons don't really seem scary. Actually, they usually seem to be more scared than the characters themselves. Special thanks to Skelton Knaggs from The Classic Horror Film Board for this suggestion. Does anybody know the location of the mansion where this was filmed. I have seen so many different rooms in it in so many different movies and TV shows that I am convinced that it is a real house, and not just a set like the Psycho House (which is on the studio ot and was missing one or more walls when built, to allow camera views inside.). The house where this was film was the "Colonial Mansion" on the Universal Studios lot in Los Angeles CA. The house was torn down about 10 years ago. It was located at the end of the suburban street where the Cleaver/ Marcus Welby house is still situated. If you look carefully at a good print of Pigeons, you can see thedriveway cul-de-sac on the mansion grounds. The house was a complete house. Sometimes the back was used to represent a different house. In "Son of Dracula" (1941 or so) the characters walk through a swamp past the gnarly tree that Boris stood near in the intro to Pigeons. The slave shack was close by as well, and was in Son of Dracula, too. I believe the house had three stairwells. One curved, one narrow and enclosed (see in the kitchen in "Markesan,) and a straight, open stairway reversed toward the rear entrance. The two main stairways made it possible to pretend that one hall and stair was in a different house during the same movie.